For a river known as the "golden watercourse," red is a strange color to see. Yet that's the shade turning up in the Yangtze River and officials have no idea why. The Yangtze, called "golden" because of the heavy rainfall it receives year-round, runs through Chongqing, Southwest China's largest industrial and commercial center, also known as the "mountain city" because of the hills and peaks upon which its many buildings and factories stand. The red color stopped some residents in their tracks. They put water from the river in bottles to save it. Fishermen and other workers who rely on the river for income kept going about their business, according to the UK's Daily Mail. 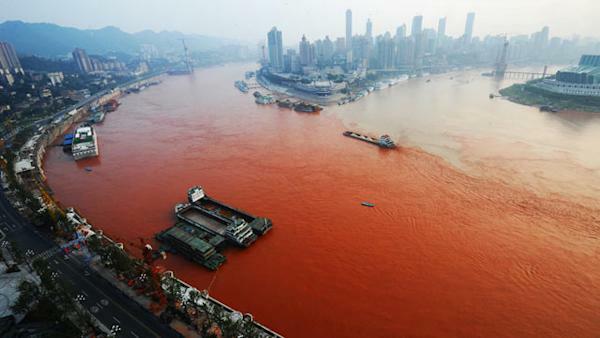 While the river's red coloring was most pronounced near Chongqing it was also reported at several other points. Officials are reportedly investigating the cause.